The Crush ‘N’ Grind Mortar & Pestle from Avanti is the best way to get the full flavour from your ingredients when you’re cooking. 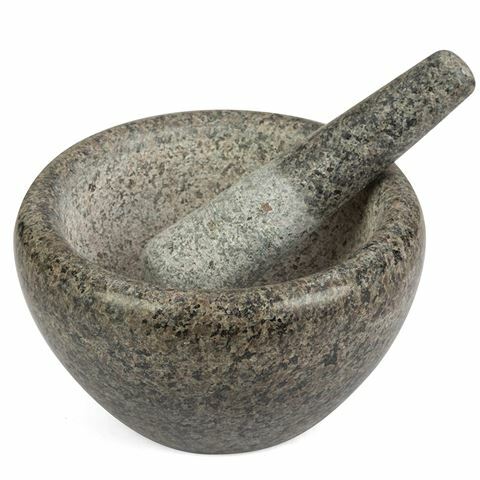 Made from solid granite, the set features a heavy mortar basin and rounded pestle both featuring smooth surfaces perfect for crushing and mixing. It’s easy – just place your fresh ingredients in the mortar and pound them to a pulp with the pestle! Throw in some chilli, coriander, lime and salt for a zingy dressing, or prepare your own spicy curry pastes from scratch. By crushing your herbs and spices with the Crush ‘N’ Grind, you can release their full flavour and add a unique touch to your cooking. There’s no need to be lily-livered in the kitchen, from now on you can show your food who’s the boss! Smooth polished interior provides clean surface for crushing. Polished exterior will look great in any kitchen.